There are many situations that a property should be bind to something outside of its NameScope. There are many situations that a property should be bind to a DynamicResource. Many UI patterns like Composite UI Applications need a mechanism to support binding across modules. In this paper, I propose a mechanism to address those issues. The ability to bind two controls that don’t belong to the same NameScope. The ability to create many transparent NameScopes. Transparent NameScopes can be existed alongside the real NameScopes and objects can be attached to them from anywhere in a project. An object can be attached to many transparent namescopes too without any conflict. It gives the developers much higher freedom in binding. The ability to bind to dynamic resources. Currently, there are similar solutions, such as the great elementSpy of Josh Smith, but their solutions uses reflection and needs fully trust permissions. The one proposed here doesn’t need fully trusted permission and also it targets wider applications. There are the following concepts in the framework. 1. TransparentResourceDictionary: TransparentResourceDictionary is a virtual NameScope that can be defined using attached properties. TransparentResources contain transparent keys plus the owner of them. If one wants to bind to an object beyond the NameScope limitation, that object should be attached to a transparent resource. 2. TransparentKey: Each object inside a TransparentResourceDictionary should have a TransparentKey in order to be identified. 3. TransparentBinding: In order to bind to an object that is attached to a TransparentResourceDictionary, you should use TransparentBinding. TransparentBinding provides properties to specify TransparentResourceDictionary plus TransparentKey. Suppose you want to bind the Content property of a Label to Text property of a TextBlock in another NameScope. First, you should define a TransparentResourceDictionary using attached properties like this. Second, you should attach the TextBlock to the TransparentResourceDictionary using attached properties. Third, you should use the TransparentBinding to bind Content property of the Label to Text Property of the TextBox. Using class diagrams is the best way to illustrate the architecture of a package. Here is the class diagram of the framework. This class acts as a Dictionary that can contain TransparentResourceItems. Here is the code of the class. As you can see in the above code, the constructor of the class adds each created instance to a static list called transparentResources. Using this trick, the framework can have access to all of the created TransparentResourceDictionaries. The class has a name property which is used to distinguish the TransparentResourceDictionaries from each other. Items inside the dictionary have been kept in its Items property. These items will be wrapped by TransparentResoureItem. Whenever, an item should be added to a TransparentResourceDictionary, an instance of the TransparentResourceItem will be created. The Source property of the created item is the real object that should be added to the dictionary and its key property is used to identify items inside a TransparentResourceDictionary. The transparentResourceItem class announces the changes of its Source property, since the target bindings needs to know the changes of their Source properties. Here is the code of the class. This class provides attached properties to allow developers create TransparentResourceDictionaries and attach items to them. The class has the following properties. TransparentNameScope: This property is used to define TransparentResources. Custom MarkupExtenstion is one of the amazing features of the WPF that provides a great deal of flexibility. Binding, StaticResource and DynamicResource are examples of predefined MarkupExtensions. In fact, they inherit from MarkupExtension. One can create his own MarkupExtensions too by inheriting from the MarkupExtension class. Here is the signature of the class. <span style="font-size:11pt;font-family:'Calibri"';font-weight:normal;">As can be seen, the class has one abstract method that should be implemented by its descendant. The method gets an IServiceProvider from the runtime that can provide context, and the method returns a value based on it. Both of the TransparentResourceBinding and TransparentPath inherit from MarkupExtension class. 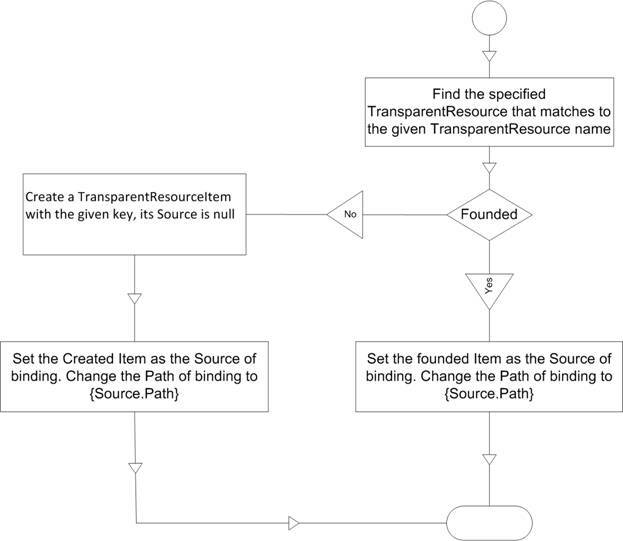 TransparentResourceBinding provides a mechanism to bind the Source property of a binding to a TransparenResourceItem. Here is the code of TransparentResourceBinding. 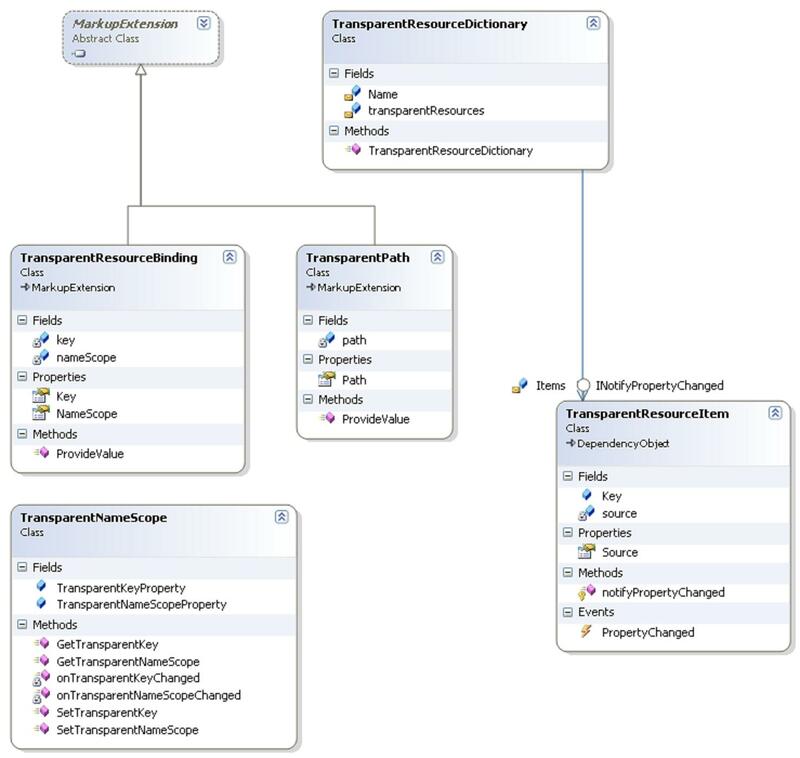 The TransparentPath has been used to specify the Path of binding instead of directly specifying the path. Actually, the TransparentPath does nothing except adding the “Source.” to the beginning of the Path. Here is the code of TransparentPath. The Scenario Behind Attaching an Object to a TransparentResourceDictionary. An old sentence says: One image is better than millions of words. Instead of describing what happened when an object is attached to a TransparentResourceDictionary, I provide a flowchart that shows the basic steps. 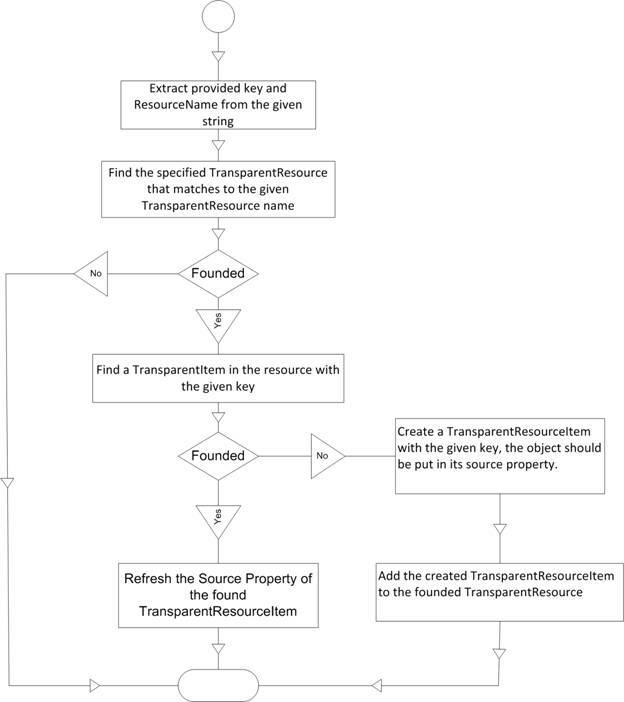 The input of the flowchart is a string that contains TransparentResourceDictionary plus TransparentResourceKey. The Scenario Behind Binding a Property to a ResourceKey.